2011 image of Chinese and Pakistani soldiers meeting at a China-Pakistan border crossing. 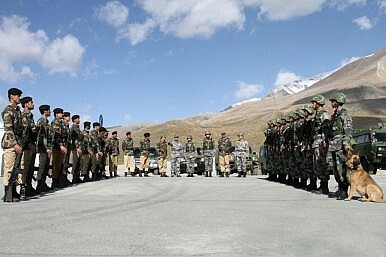 The joint patrol took place amidst much media attention on India’s tank deployment in Ladakh. In a first, the China’s People’s Liberation Army (PLA) and Pakistan’s border police force carried out a joint patrol along their shared border. While China has been patrolling the region since 2014, this is the first time that the two allies have carried out a joint patrol in the region. The event, reported in a pictorial published by the People’s Daily, took place against the backdrop of India’s tank deployment in Ladakh and reports of over 100 Uyghurs from Xinjiang joining the Islamic State. It is interesting to note that the area of the patrol, identified in the report as “the China-Pakistan border,” is the frontier region of Pakistan-occupied Kashmir — an area claimed by India as an integral part of its territory. China’s Xinjiang Uygur Autonomous Region borders Pakistan-occupied Kashmir and does not share a border with mainland Pakistan. China, which usually refers to the disputed area as “Pakistan-administered Kashmir,” has recently indicated a change in its stand on the Kashmir by initiating infrastructure development projects in the disputed region — even while opposing India’s oil exploration initiative in the South China Sea. The timing of this joint patrol is significantly important as it took place amidst much media attention on India’s tank deployment in Ladakh. As I reported earlier, India has deployed over 100 T-72 tanks in Ladakh to counter China’s military buildup along the disputed border. Reactions emanating from Beijing, such as this report describing how tank deployment could affect Chinese investment in India, seem to indicate China’s displeasure with New Delhi’s corrosive diplomacy. The joint border patrol by China and Pakistan could well be an indication for New Delhi in this regard. India, currently dealing with an uprising in the disputed state, is likely to ignore the engagement, only to react at the first possible opportunity. It is also important to note that the joint patrolling comes at a time when New Delhi has blamed Islamabad for infiltrating militants across the Line of Control. The joint patrols could also be seen as a measure to reduce movement of militants across the region. The New American Foundation, a Washington-based think tank, has said that over 100 men from China’s Xinjiang province were among thousands of foreign fighters recruited by ISIS. Quoting the think-tank, Chinese media said: “Of the more than 3,500 foreigners recruited to join ISIS, the report stated that 114 came from Xinjiang, making the region the fifth largest contributor.” In its report released on Wednesday, the think tank stated that tough religious restrictions on Muslim minorities in China’s Xinjiang Uyghur Autonomous Region could have driven over 100 Uyghurs to join the ISIS, but found that those joining ISIS lacked experience with jihad, raising questions about China’s official narrative of radicalization in Xinjiang by the East Turkestan Islamic Movement (ETIM). The East Turkestan Islamic Movement, a separatist group operating in China’s Xinjiang Uyghur Autonomous Region, is said to have operated training camps Pakistan’s tribal areas in the past, which were eliminated by Pakistan military in massive air and ground operations, under pressure from China. Prakhar Gupta is a foreign affairs analyst and an independent journalist. His work has appeared in the Indian Defense Review, South Asian Voices, Eurasia Review, and Youth Ki Awaz, among others. China Isn’t Hearing Asia’s Fears About Its Military BuildupIs China’s Path to Military Parity With the US Through Intellectual Property Theft Doomed?Pakistan, Russia to Hold Joint Military ExerciseChina’s Security Gambit in the Indian OceanCould China Flash Invade Taiwan?